George Bush is frustrated that Americans don't realize we need immigrants to pick our cotton. Former President George W. Bush says he's "disturbed" by the immigration debate occurring under President Trump, where after decades, Americans are speaking out against mass immigration to the United States. 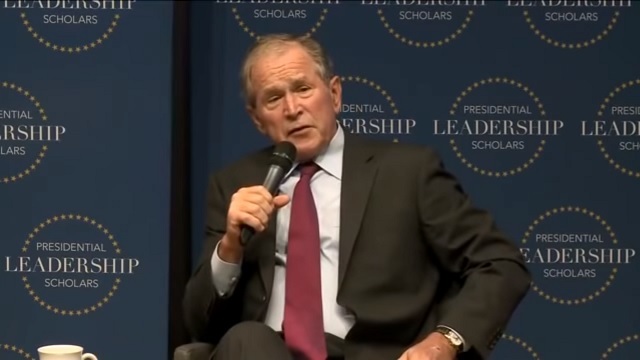 During a panel discussion alongside former President Bill Clinton, Bush said the current immigration debate "doesn't recognize" the "valuable contributions" of foreign nationals. "I'm disturbed by the debate that's taking place because I think it undermines the goodness of America," Bush said. "I think it doesn't recognize the valuable contributions that immigrants make to our society. And it obscures the fact — the rhetoric does — that the system is broken and needs to be fixed." Since the 1990's, the U.S. has been admitting on average more than 1.5 million legal immigrants to the country every year — the vast majority of which are arriving from Central America and Mexico and are unskilled workers who compete for scarce blue collar jobs with working and middle class Americans. I think it's more likely he just disturbed a debate is taking place.